Shopping for Landscape Hedges in Saint Petersburg, Florida or Palm Trees? Buy landscape hedges in Saint Petersburg, Florida at A Quality Plant today. 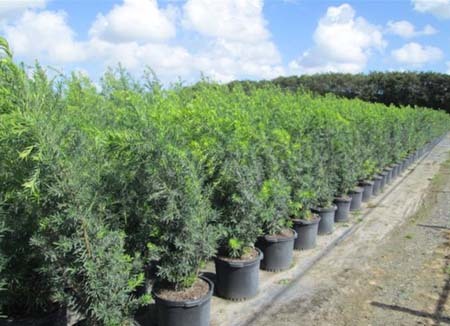 Located in Ruskin, Florida we offer a variety of landscape hedges. We are known primarily for our wholesale palm tree farm. Our farm has a number of palm trees that come in different sizes to fit your landscaping needs. Some are grown in the field while others are grown in containers. Please note that we do offer container palms in landscape sizes that you can easily plant in your own field. The Areca Palm/Golden Cane Palm is a midsized palm made up of several slim trunks that create a dense look. It also showcases a vibrant color with yellow leafstalks and V-shaped leaves. It is perfect to buy this landscape hedge in Saint Petersburg, Florida as it flourishes in subtropical to tropical climates. The Golden Cane Palm is primarily known for being a popularindoor plant. The Bismarck Palm differs from the Golden Cane Palm with silver, blue fan leaves with a tall column like trunk. Before it matures completely, the Bismarck Palm with showoff a purple-red color. It withstands colder temperatures as well but it is still suitable for gardens and parks. If you are looking for a breathtaking palm, this is it as it will grow to be over20’ wide and have a 5-6’ trunk. Our Chinese Fan Palm is one enjoyed by everyone. It can be potted anywhere but looks especially nice in tropical homes or subtropical venues. This palm too does well in subtropical climates but can still flourishin short frosts. The leaves of this palm are lime green with curled tips. The Canary Island Date Palm is typically seen all around in Saint Petersburg, Florida because it does well in the warm temperature. This palm has a very thick trunk and far reaching fronds. It is most known for itspineapple shape on the top after being trimmed. The Reclinata Palm offers a fuller look that is made up of multiple slender trunks and dense leaves. This palm can produce a number of different leaf shapes because of it’s ability to hybridize with other date palms. Therefore it is not unusual to see this palm with different leaf shapes. The Sylvester Palm is a rarity although it is known for how fast it can grow. This palm too has a tall trunk but is slimmer than the other palms mentioned. It is dense, with grey colored leaves that curve. This is a great palm tree to consider if you are looking for something that is easy togrow. Florida’s beautiful climate, allows us to offer beautiful tropical landscape hedging such as gingers. Our gingers feature white and pink flower buds that bloom into yellow flowers. This hedge is very tall and dramatic with leaves that are 2 ft long and 6 inches across. The leaves have green and yellow stripes that also add to it’s dramatic flair. If you are looking to revamp your current landscape, buy landscape hedges in Saint Petersburg, Florida today!